True leadership greatness involves motivating a team, a family, or a tribe, to achieve something that is bigger than the leader themselves. 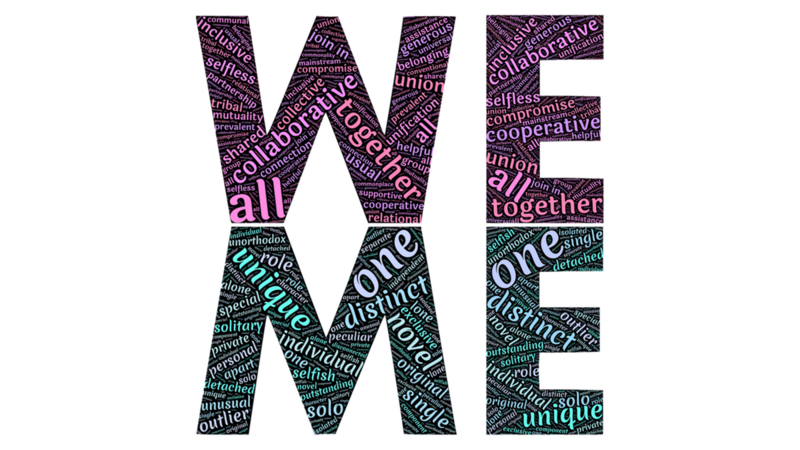 That leadership excellence begins with a “WE” mentality. Nearly every person or team that has ever been successful has had other people supporting them. Sure, there are a few outliers that shouldered everything themselves and achieved some level of success. But true leadership greatness involves motivating a team, a family, or a tribe, to achieve something that is bigger than the leader themselves. That leadership excellence begins with a “WE” mentality. I was recently invited to participate in an event that included some of the brightest minds in our industry. While these people had all achieved high levels of praise and achievement in their careers, everyone had failed here and there. However in the case of the high achieving leaders in the room, the long-term result for most of them was sustained success, even with a few bumps in the road along the way. Honestly, many of those in attendance at this particular event border on greatness. They set the bar so high for the leaders in our space, that you could look at them and say, “Man, how do I get there?” Here are my thoughts on the answer…..
“I” won’t get you there. “WE” will. No matter what your management style is, or your personality type, you need a team of supporters to be successful over any sustained period of time. Growing up as the son of a coach, and later a coach myself, the team concept is part of my DNA. You can use whatever billboard materials you want here, but the bottom line is TEAM beats ME. My theory for everything is that “WE” will get us to the final destination. There is no place for “ME” or “I”. Okay, so you could say, “Well nobody would do it, so I did it and the end result was great.” Even if that is the case on an event, a capital campaign, or a volunteer drive, here is the question…..What does it hurt to give praise to “WE” over “ME”? Even if you did it all, using WE will draw more people inside the proverbial tent, which will garner you more influence for the next project that lies ahead. People in the know (your boss, stakeholders, board members, investors) are keenly aware of who is leading the charge. If you don’t think that, you may want to reassess things. “WE” is always the best pathway, even if you think you did all the heavy lifting. Great leaders are inclusive team builders that strive to garner support towards a common goal. That starts with getting people to buy into a unified vision and to get people on board. This is “WE” not “ME”. Michael Jordan was the best basketball player in the world for a decade before he got a solid coach (and the triangle offense), several good supporting players, and a team system that could incorporate his individual greatness. Once these elements were put in place and MJ had a structure with which to play team basketball, and the championships started coming. Final score for “WE” was six NBA titles. Score for Michael as a league leading scorer and solo artist? Zero titles. WE 6, ME 0. Abby Wambach is the greatest goal scorer in the history of international soccer, for both men and women. She won the FIFA Player of the Year award as the world’s top player 10 times. In her last run as a player on the US National Team in the 2015 World Cup, the coach asked her to come off the bench, believing that was their best chance to win the championship. Think about that. Possibly the sport’s best player in history was asked to be a substitute in the biggest event in the world. What did she do? She took that role and put WE in front of ME. The end result? A World Cup victory for the Unites States. WE wins again. There are numerous examples like these that could be added to the list. Veteran players taking lesser/subordinate roles (think Dwayne Wade), individuals changing positions to allow the team to get the best players on the field (Cal Ripken Jr.), players restructuring their contracts to allow the franchise to sign a much needed free agent (Tom Brady and several other NFL quarterbacks fall into this category). In all of these cases and those like them, WE came first over ME. There are a lot of people out in the world that are in it for themselves at the expense of the greater good. The world really doesn’t have a place for these individuals. If you have these types of people around you, remove them. The journey is much more fulfilling when you build a team and work together towards a common goal. (Author’s Note: Seth Godin’s book “Tribes” is a great read on the topic of building and leading a team). The most successful leaders put WE before ME. By doing so, these leaders know that whatever their own individual goals are, they are more likely to come to fruition with the help of others in a team environment. The big question is this….. At the end of the day, what would it hurt to be more inclusive and be part of the “WE” rather than the alternative of trying to do something yourself? It never hurts to be a collaborative and inclusive leader. It never hurts to be part of WE over ME. Jon Schmieder is the Founder of the Huddle Up Group LLC, a sports industry consulting company led by award winning executives. Schmieder has over 20 years of experience in leading sports tourism and events organizations through strategic growth and increased community collaboration. The Huddle Up Group has worked with more than 50 sports organizations and destinations on nearly 100 different strategic projects. In 2017 the Huddle Up Group was given the Superior Service Award, the highest honor a consulting firm can earn from the National Association of Sports Commissions. We can be reached at Jon@HuddleUpGroup.com or 602.369.6955. To receive the weekly “Monday Huddle Up” sign up at www.tinyletter.com/JonSchmieder.